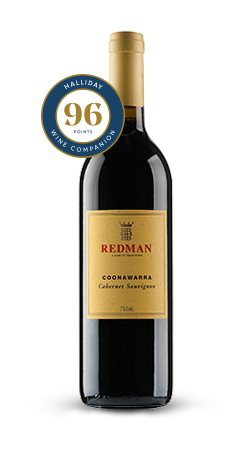 Indulge in classic Coonawarra Cabernet Sauvignon with this 2015 vintage from Redman. From a seasonal point of view, April to July 2014 provided an excellent start with average winter rainfall setting us up for an even budburst with good soil moisture. Spring, however, was not typical, being very dry and one of Coonawarra’s warmest, with temperatures well above average. These high temperatures advanced flowering in November by about two weeks. Very dry conditions continued through December, consequently berries remained small with thick skins. Ripening was set up perfectly with the vines receiving a refreshing drink of 90mm of rain in mid-January. The grapes were harvested in the last week of March and the first week in April. The grapes were mechanically harvested and crushed in the field. Initial fermentation was carried out in open concrete fermenting tanks and the cap was hand plunged twice a day. One-third of the wine was run off into new French oak hogsheads, where fermentation was completed. The balance of the wine completed fermentation on skins, and was then transferred to barrels. The wine was bottled, in February 2017, after 14 months ageing in French oak hogsheads. Colour: dark red with purple hue. Bouquet: exhibits violets, cassis, dark berry fruit with overtones of oak. Palate: the mid-weight palate shows excellent flavour and structure with rich fruit and fine grained tannins. The finish is long and flavoursome.